The number of calls made by transgender people to suicide hotlines has more than doubled following Trump’s transphobic tweet which banned trans troops. 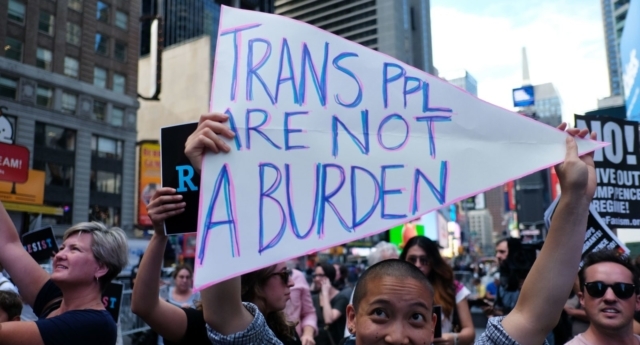 The Trevor Project, one of the largest LGBT+ youth crisis intervention organisations in the US, reported that prior to Trump’s transphobia 7.3 percent of people reaching out to their suicide prevention services were transgender. However, following the tweet, they say that they saw that number jump to 17.5 percent. They also say that the anti-trans bathroom bill in Texas played a part in trans people reaching out to the service. Amit Paley, the CEO and Executive Director of the Trevor Project explained that the data proved that the current political rhetoric in the US was causing damage. Paley said: “This data makes clear that our elected officials can no longer ignore that their anti-transgender rhetoric is putting lives at risk. They added that the Project would, of course, continue to serve the transgender community during this time of persecution, but called on political leaders to also take action. “While The Trevor Project will continue to be there for them around the clock, our elected officials must stop throwing young people into crisis for political gain. “Discrimination is un-American, and we will hold to account those legislators who attack the most vulnerable members of the LGBTQ community,” Paley added. Lou Weaver of Equality Texas said that the anti-LGBT moves of the Trump administration and the consequences were unacceptable. “The anti-LGBTQ rhetoric and all of the anti-transgender policies have directly resulted in members of our community being assaulted and our parents being afraid for their children,” Weaver said. Chuck Smith, the CEO of Equality Texas said that it was unfair that trans youth were being victimised because of politics. “It’s summertime. Families with children should be having fun and reconnecting during their summer break. Instead, families with trans youth are travelling for hours to testify against bathroom bills, because the lieutenant governor has decided to pick on an already bullied group of kids. “The news from the Trevor Project regarding the spike in communications is heartbreaking Attacking transgender kids with discriminatory legislation puts them in crisis. Enough is enough! The Texas Legislature needs to stop the bathroom bills,” Smith said. Suicide is preventable. Readers who are affected by the issues raised in this story are encouraged to contact Samaritans on 116 123 (www.samaritans.org), or Mind on 0300 123 3393 (www.mind.org.uk). ​Readers in the US are encouraged to contact the National Suicide Prevention Line on 1-800-273-8255.